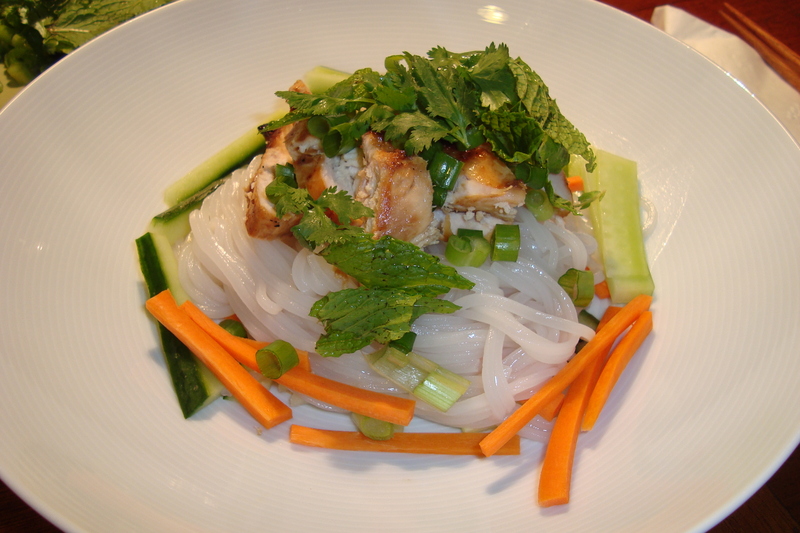 Yesterday we drove to the San Gabriel Valley to get Chinese food for lunch. My friend Pearl recommended J & J Restaurant, and it did not disappoint us. It’s a tiny place with only about ten tables, but it’s in a strip mall with several other Chinese restaurants, so you won’t have to wait if you don’t want to. Paco let me order, so we did not have any of the old standbys (beef with broccoli. . .). We had xiao long bao, which is what they’re known for. 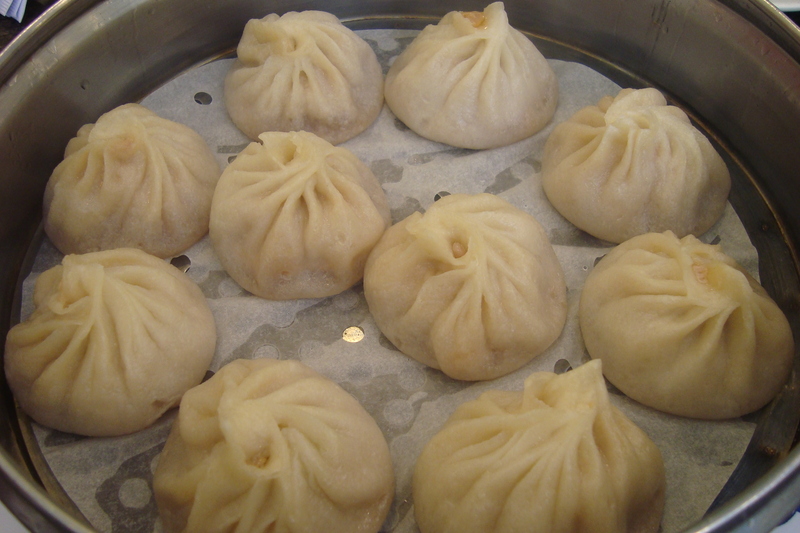 These are steamed dumplings filled with pork or pork and crab. 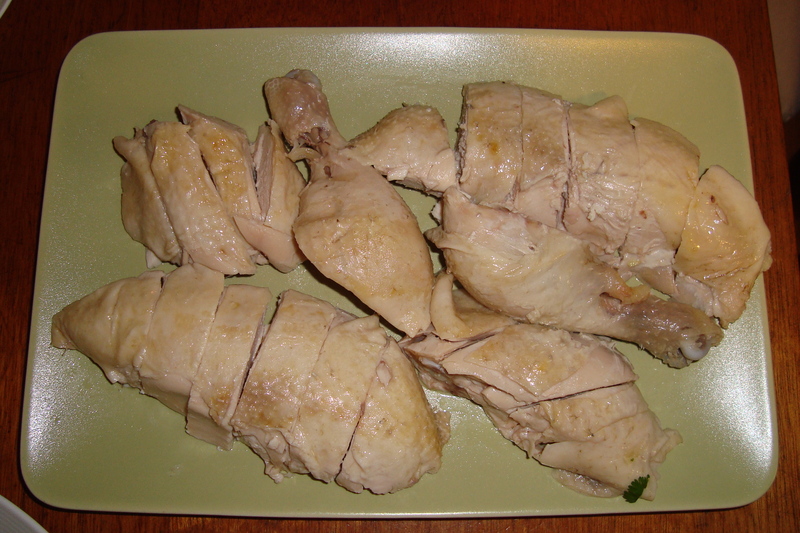 When the dumplings are made, a cube of gelatinous broth is included in the filling. While the dumpling steams, the broth melts. When you bite into it, savory, steaming hot broth fills your mouth. You can often find these at dim sum restaurants, but they may be a little dry if they’ve been sitting on the cart for a while. The freshly steamed dumplings at J & J were amazing. The noodle soup with braised beef was great if you like Chinese beef stew (you know, with tendons and who-knows-what braised until tender). 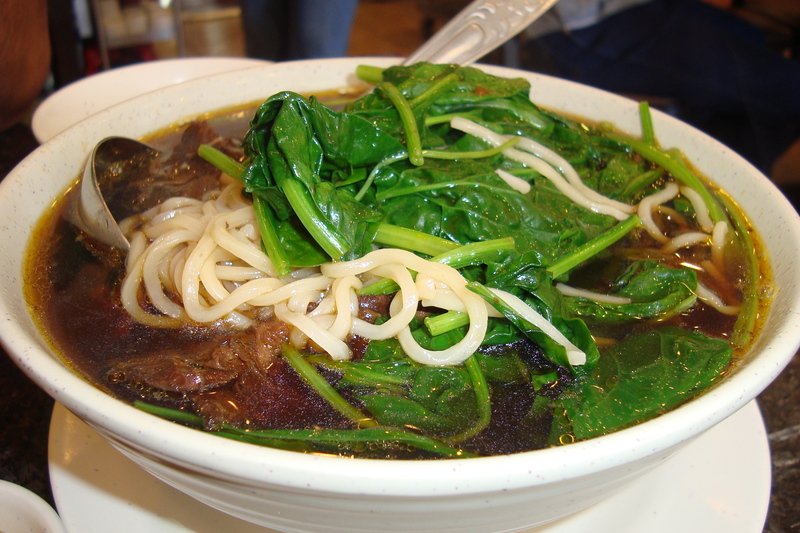 The broth was dark but mild, which complemented the flavorful beef nicely. I had to order the braised pork with bean curd skins because I love bean curd skins. 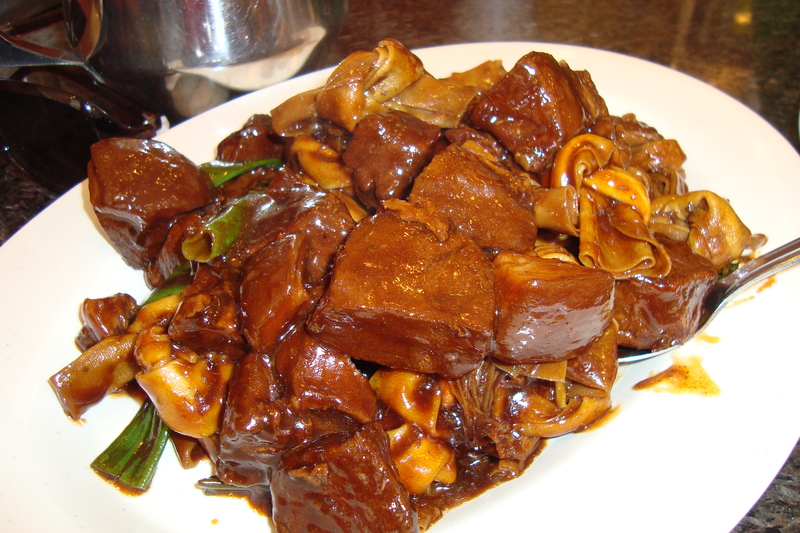 The pork was braised until super tender, and the bean curd skins were tied into little knots, which was cute and made them easy to eat. We rounded out our San Gabriel experience with foot massages! ($15 for an hour or $10 for 30 minutes.) What a perfect afternoon. When I saw the Pioneer Woman’s post about Pork Chops with Pineapple Fried Rice and realized that I have both pork chops and pineapple in my fridge, I decided that I had to give the recipe a shot! 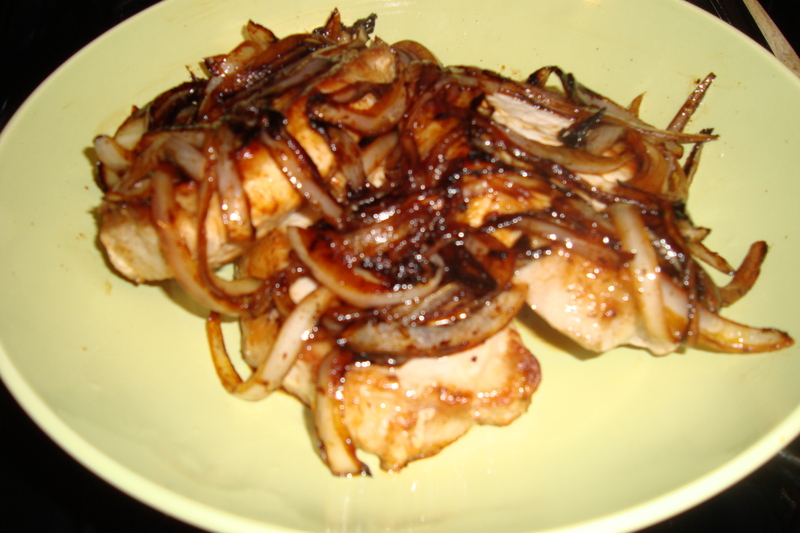 Her pork chops look delicious, so I followed the recipe closely and made a sauce out of onions, soy sauce, rice wine vinegar, sriracha, and honey. I brined my pork chops first for added juiciness. 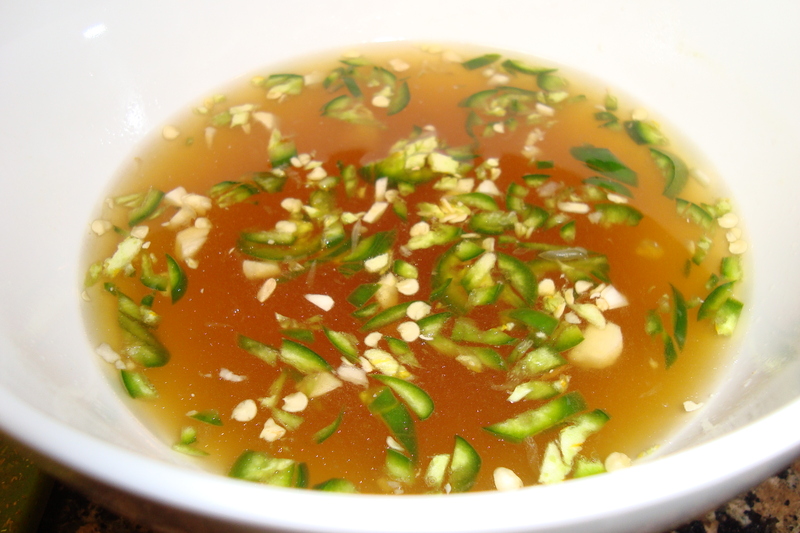 To brine: Dissolve a spoon of sugar and a spoon of salt in a cup of hot water in a large bowl. Add ice cubes and cold water until the bowl is 2/3 full, then add your pork chops. 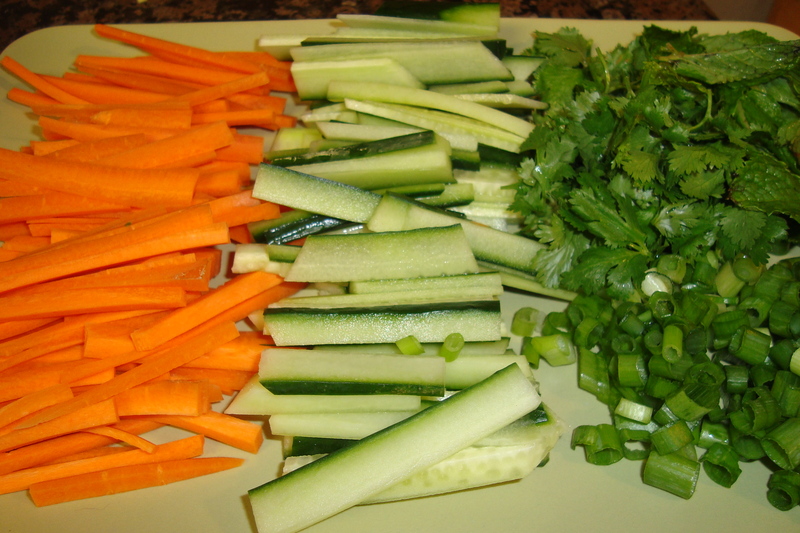 Cover and refrigerate for 30 minutes to 4 hours before cooking. Rinse the pork chops before cooking. Do not salt them! 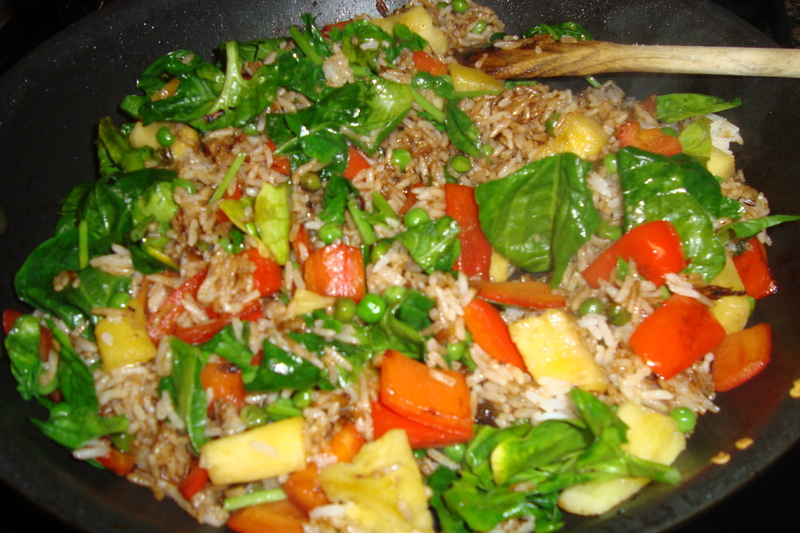 For the fried rice, I made my usual version, with ginger, garlic, red bell pepper, spinach, pineapple, and peas. 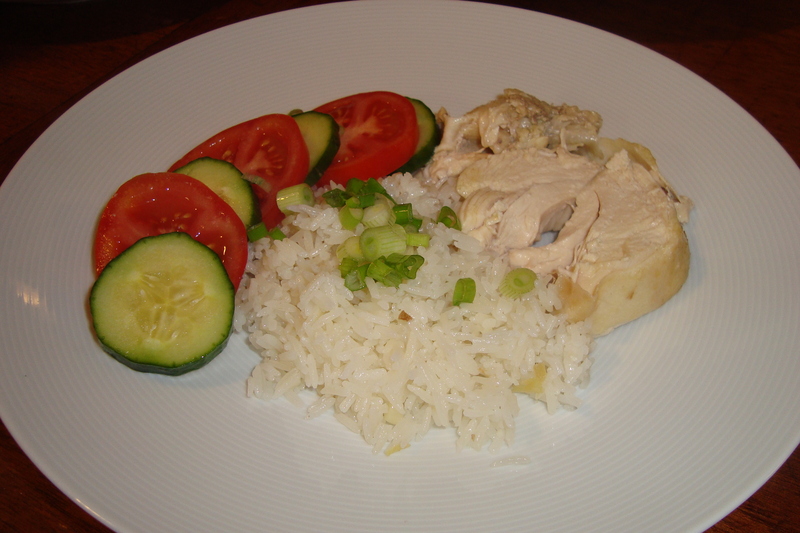 The only additional seasoning that I added to the rice was a drizzle of sesame oil, since I cooked it in the same pan as the pork chops and the sauce. 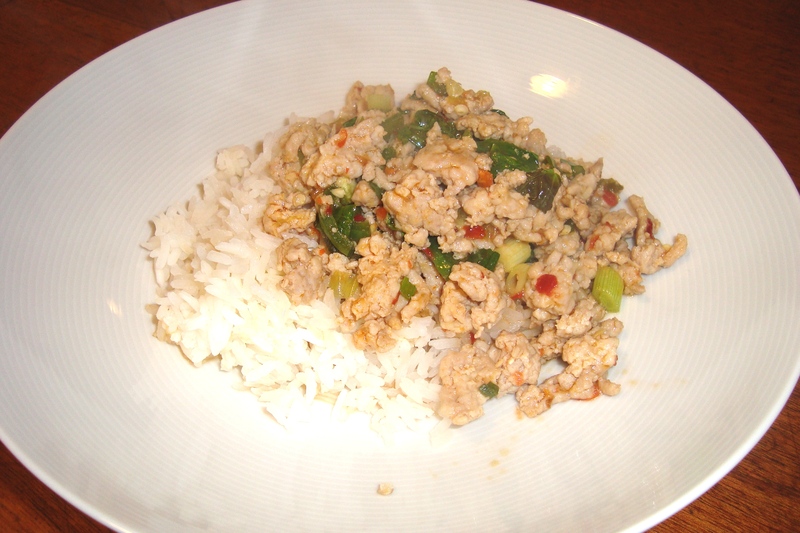 Taste your rice and add soy sauce, sriracha, fish sauce, or sesame oil as desired. 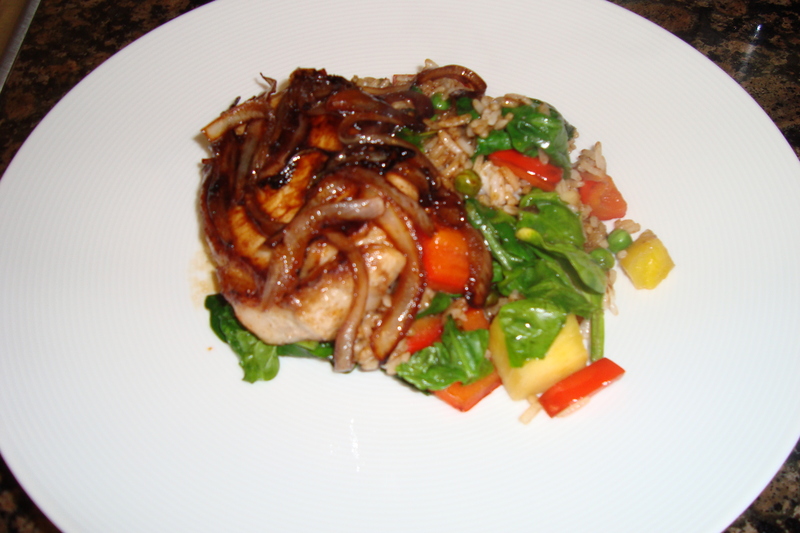 Serve the pork chops with onions and sauce over the rice. Enjoy!